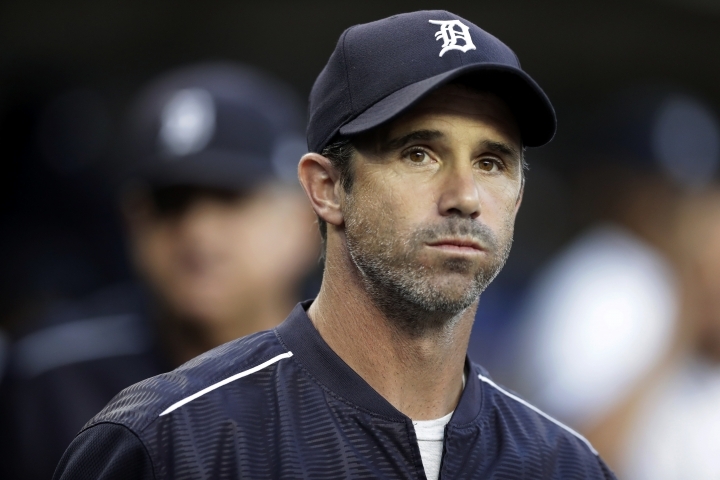 ANAHEIM, Calif. — Brad Ausmus was named the Los Angeles Angels' manager on Sunday, moving from the front office to the dugout to replace longtime skipper Mike Scioscia. Scioscia had held the job since the 2000 season, winning the Angels' only World Series title and becoming the winningest manager in franchise history. He left the club earlier this month after 19 seasons and 1,650 victories. But after finishing 80-82 for the second consecutive year, the Angels are coming off three straight losing seasons overall for the first time since 1992-94. Los Angeles has played only three postseason games in the past nine seasons, losing them all in 2014 after winning the AL West. While both men had lengthy careers as big league catchers, the 49-year-old Ausmus likely represents a philosophical shift from Scioscia, who was widely perceived as an old-school manager despite his public embrace of new baseball mentalities. After Scioscia's departure three weeks ago, Eppler said he wanted the Angels' 17th manager to be well-versed in analytics and probability-based decision-making. Ausmus was not known to be thoroughly reliant on data during his up-and-down tenure in Detroit, but he clearly sold Eppler and owner Arte Moreno on his willingness to evolve into the modern manager that the Angels want. "Ultimately, Brad's balance of connectivity, communication and leadership skills as well as his understanding of evolving strategies and probabilistic approach to decision-making led us to him," Eppler said in a statement. "We believe his knowledge, drive and growth-mindset will allow him to integrate seamlessly with our players and staff and will be pivotal in advancing our culture and moving us toward our goals as an organization." Before joining the Angels' front office, Ausmus managed the Tigers from 2014-17. Detroit won 90 games and the AL Central during his first season, but went just 314-332 in his tenure. His contract wasn't renewed after the Tigers went 64-98 in 2017, embarking on a franchise rebuild during the season. Ausmus was praised for his personnel management, but was not considered an analytics-first decision-maker — and the Dartmouth graduate was criticized for faults often attributed to old-school skippers, including overuse of starting pitchers and an adherence to rigid roles for his relievers. Both Ausmus and the Angels haven't been in the playoffs since 2014, but they'll try to get back together. Ausmus joined the Angels' front office last November, filling the same role held in 2016 by Bud Black, who had been hired to manage the Colorado Rockies. Earlier in the day, the Cincinnati Reds hired David Bell as their new manager. The Baltimore Orioles, Minnesota Twins, Texas Rangers and Toronto Blue Jays still have managerial openings. Ausmus played 18 major league seasons with four franchises as a catcher, including 10 years with the Houston Astros before his final two seasons with the Los Angeles Dodgers in 2009-10. He is 11th in baseball history with 1,766 games started as a catcher, and he is third in baseball history among catchers with 12,839 putouts. Ausmus takes charge at a key point for the big-budget Angels, who have missed the playoffs in four consecutive seasons and haven't won a postseason game since 2009. Mike Trout has two seasons remaining on his current contract, and the Angels likely need to build a playoff contender in 2019 to keep their franchise player happy. Ausmus also must lead the Angels' efforts to maximize the success of Shohei Ohtani, who won't pitch next season after undergoing Tommy John surgery. And Ausmus must work with Eppler to figure out the role of slugger Albert Pujols, who will be 39 years old when he returns next year for the eighth season of his massive 10-year contract. Ausmus' Angels will have the benefit of a farm system that has improved markedly during Eppler's three seasons in charge. Eppler also plans to be active in the free-agent market for pitchers after the Angels had massive injury problems on the mound last season. The Angels hadn't hired a new manager since November 1999, when Scioscia took over a franchise that had made only three playoff appearances in 39 seasons of existence. Scioscia ushered in the Angels' golden age in 2002 when he led a wild card playoff team to the title, beating the San Francisco Giants in a seven-game World Series. The Angels made six playoff appearances in an eight-year stretch, winning five AL West titles. But after reaching the ALCS in 2009, the Angels have had just one 90-win campaign and one playoff appearance in the ensuing nine years.